Need Al Czervik from CaddyShack for your next Golf Tourney? 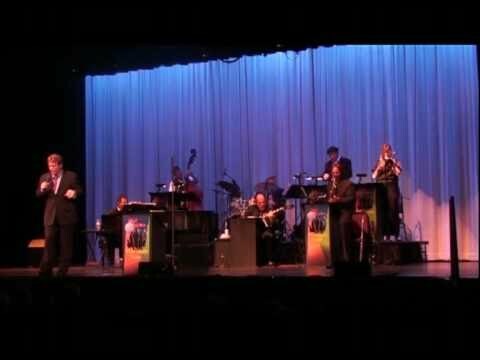 Phil Jeffrey will take you back in time to when Frank Sinatra dominated the charts and Jazz and Swing music flowed from every nightclub across America with their infectious sound. Leading the band is Phil Jeffrey with a unique repertoire from the Great American Songbook & his haunting vocals reminiscent of a bygone era. His confident charm has captivated audiences for years & most recently for HBO's critically acclaimed "Nightingale". "Phil Jeffrey shines" - he brings back the red carpet feeling to Hollywood & he's funny! I Just gotta' say that Phil Jeffrey has the spirit of Hollywood in his soul! Phil was a pleasure to work with and his performance was flawless at my 60th birthday party. I would strongly recommend Phil Jeffrey for any venue as his Sinatra Tribute was outstanding! Phil took time to meet, greet and mingle with everyone at the party and personalize his performance so everyone was involved singing along and dancing. Phil Jeffery Made The Party! This man can sing. We danced and listened to him and could of all night. He came in and schmoozed the crowd like he was one of them and when it was his turn to perform he delivered! It was my moms 80th and she won't forget it. He also respected all my wishes and came through! We hope to hire him again! What a voice! Phil has a wonderful voice. 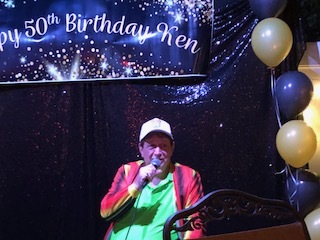 He entertained at my husband's 50th birthday party with Frank Sinatra type singing and also did some Rodney Dangerfield comedy. Everyone enjoyed his performance! We used Phil as the entertainment before our meeting started. He arrived early which was appreciated and has a great "Frank Sinatra" style voice. The music definitely makes you want to dance! It's probably best when dancing or throwing a party as opposed to background music. Hit the mark for a 91 year old birthday. On time, set up quickly and easily, sang his songs as we partied and finished on time for elderly folks. Great experience. Phil was the hit of our party! Thank you Phil for making my parents 80th birthday party magical! I cant imagine anyone sounding more like Frank Sinatra! We all danced the night away and will always remember this very special time. I will hire you again and again! It was a real honor to be a guest at the CBS event "Big Hearts for Little Kids" on New York Street. "Musique Noir" featuring Phil Jeffrey was outstanding. Phil is an excellent musician and entertainer! Absolutely delightful. Thank you Phil. Wow, Talk about talent! I recently saw Phil Jeffrey and his Musique Noir band play at a charity event I attended. Everyone at my table had a great time - the music was perfect. Phil gave the party LIFE! People were dancing, people were singing along - it was a magical evening. A Stellar performance and a great Emcee as well. The charity brought in a lot of money with the help of Phil. I would highly recommend him. Phil Jeffrey was Amazing! I had a wonderful time listening to the songs I love performed by such a great singer. His band was terrific too! We all had such a good time during the entire night! 5 stars!!! I attended CDI'S Annual Block Party. He was very professional and everyone enjoyed his singing as did I.
I had the pleasure of attending this special Charity Venue, and I so enjoyed. Since music is my passion, Mr Phil Jeffrey, made the evening spectacular with his beautiful singing voice, choice of songs, and his charisma, charm, and even funny he was at times, I thoroughly enjoyed. Mr Phil Jeffrey is professional, and he knows how to draw people in,,for a fun evening. I look forward to see Mr. Phil Jeffrey again, thank you. I would highly reccommend him for any event. He was very professional, personable and accomodating to our very needs. He was a pleasure to work with. He was on time and sung some beautiful songs on our Valentine's Day event. I would hire Phil again when our next event comes up..thanks much Phil for making some nice memories for us..sincerely Bryan O. from Rancho Cucamonga, Ca. Just wanted to follow up the big weekend at Pelican Hill Resort with a big thank you to you and your band for making our big night a huge success. From Rodney Dangerfield to Frank Sinatra to Dean Martin, our group had a terrific time laughing, listening, and dancing to your music. Hopefully we will return to Southern California next year to celebrate another successful sales year for North Coast, and when we do you will be on the list to call. Feel free to use me as a referral anytime. Look forward to the next time we meet. Phil started his professional career while only a teenager in the song-and-dance chorus of NBC-TV's Jerry Lewis Show as one of the Doodle Town Pipers, and went on to guest star on ABC network's 90 Tonight show. Moving on to nightclub appearances, by himself and as lead singer Phil's played singing and comedy dates from one end of the country to the other, including Los Angeles, Las Vegas, and New York. big bands across the country in a Tribute to Frank as a special guest. 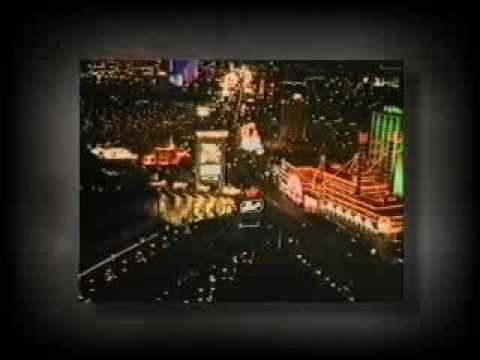 Events have included private parties and weddings, at the Mirage in Las Vegas, Shutters on the Beach, Loew's Santa Monica and the Peninsula Hotel in Beverly Hills, and as a Las Vegas headliner for convention dates at Caesar's Palace, the Riviera, and the Las Vegas Hilton. Also in Vegas, Phil has made multiple appearances fronting a 17 piece big band for dates at the Showboat, the Riviera, the Stardust, the Goldcoast and Arizona Charlie's. Phil is widely acclaimed for his incredible recreation of the sound of Frank Sinatra at the peak of his popularity during the Pal Joey era of the late 50s which Phil originated for the Las Vegas production of Legends in Concert at the Imperial Palace Hotel. 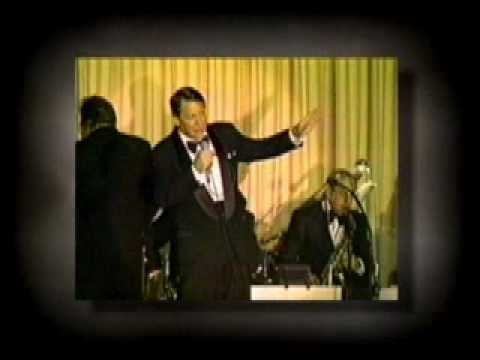 He's appeared as Frank, singing the classic Sinatra, Phil's presented his interpretation of Frank's songs in nightclubs, at conventions and private parties, even aboard cruise ships! Acting, comedy, singing, and one unbelievable musical interpretation. More than 30 years in show business. That's a trouper - that's Phil Jeffrey! With a unique repertoire from the Great American Song Book, Musique Noir takes audiences back to a time when Frank Sinatra Dominated the charts and jazz and swing music flowed from every nightclub across America. Their infectious sound can be heard at concerts, Vegas hotels and casinos, dances, festivals, parties, nightclubs, cruise ships, and countless other venues. Leading the band is Phil Jeffrey, with his haunting vocals reminiscent of a bygone era. his confident charm has captivated audiences for over 40 years and has won the praises of fans around the world. Enjoy the smooth and sultry sounds of Musique Noir as they take you on a nostalgic journey with some of America's greatest music. Sinatra, Rat Pack, Dean Martin, all songs from the "Great American Songbook" to Michael Buble. Phil is simply legendary. He is definitely multi-faceted. His talents and years of training and experience allow him to really share with his audiences in touching ways, no matter the venue. Importantly, Phil is a true Entertainer who is engaging and enjoyable every time. From a Big Band, to 7 pieces or a quartet, to simply a piano or even pre-recorded music -- Phil brings his "A" Game. A true professional. Singing and Comedy are but two of his strong suits. He spreads the love, the memories and the laughter that you're looking for. Thank you Phil for your performance yesterday at our annual Sipping in Springtime Art, Wine and Food Festival! It has been a pleasure to work with you. Your wonderful voice and stage presence yesterday were the perfect complement to the ambience of our event at the historic Stagecoach Inn! I can't tell you how many guests, young and old, approached me about how they enjoyed your singing and how much you sounded like Frank Sinatra! One guest called your voice "Magical"! You really helped to make our event memorable and I would highly recommend you to party planners, event coordinators and anyone who is looking for entertainment to make their event unique and special! Thank you again and please feel free to use me as a reference! I had recently celebrated my __ years of blessings. I have started calling some of the bands I have heard and even known personally but something told me to explore another route. That's when I found Phil Jeffrey. The moment I heard him and saw his videos, I felt I had found what I was looking for. Well, come the actual party, Phil and his guys were fabulous. They really wowed my guests and everyone is still raving about the party and the music. I have to say Phil Jeffrey was heaven sent! Music is a big part of my life and I am glad I picked him for my special event. I would no doubt recommend him to anyone looking to have the perfect entertainment. P. Jeffrey is a consummate professional. Prior to the event he was proactive in communicating, responsive and accommodating to requests, and shared his vast experience in making sure that we were prepared for the event as a whole. The truly great part was that I knew I could trust Phil from our early conversations. With that piece of mind, the ent. portion of the evening was the absolute least of my worries as I had full confidence in Phil's abilities. He met with the owner of the venue and handled all preparations for the entertainment. Candidly, all I had to do was show up and enjoy the great performance. Phil, thank you for your time, energy, and performance! 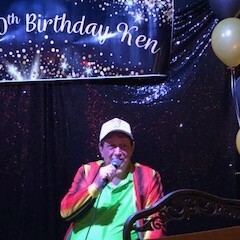 We hired Phil Jeffrey to sing at our mother's 80th Birthday Party. Phil was very professional. He arrived on time, set up in a jiffy and was singing in a matter of minutes. He has a wonderful voice and he sang all the songs of the 40's and 50's, our mother's favorites. His music was incredible. We would hire him again. He was a definite hit! I would like to express my gratitude on behalf of Euro-Masters Classic Cars for your assistance in making our Grand Opening an evening to remember. We had a wonderful turn-out and that would not have been possible without the help of you and your band. Phil, you guys were amazing, everyone loved the performance and you really helped set the atmosphere that we were hoping to attain. I look forward to working with you again in the future. It was a pleasure to meet you. I truly enjoyed your performance at the Senior Christmas party. I am looking forward to see you working with the Imperial Palace's Legends in Concert. You are a very talented individual. I wish you much success in your future endeavors. I wanted to thank you and Musique Noir for presenting such an enjoyable performance at The Los Angeles Country Club's Valentine's Day Dinner-Dance on February 14, 2009. You were a pleasure to work with and truly held up your promise of making it an evening our members will remember. The style and atmosphere you and your band created was exactly what we were looking for and we look forward to having you again at the Club for New Years' Eve 2009. As I'm sure you call from the response of those in attendance, the event was a tremendous success! Thank you for your participation in the City of Beverly Hills' 2009 Summer Nights in the Plaza concert series. Your tribute to Frank Sinatra on July 18, 2009 was fantastic. When I looked around the Plaza I saw most patrons tapping their feet and singing along. The standing room only crowd of 600 people had smiles on their faces as they left the venue. Your supporting musicians had great stage presence and the camaraderie was evident throughout the performance. I look forward to working with you in the future.